Presented February 22, 2016 at IxDA Bloomington. The outline for the workshop was created as a mind map on an index card. Mind mapping has been a technique I’ve used for note taking and note making since I read The Mind Map Book in 2010. Words sprout radially from a central image, forming flexible structures of ideas. These two-dimensional, graphical notes stamp a pattern in memory, making it easier to retain and recall. It fosters comprehension, reflection, and exploration. It induces creativity, spontaneity, and conciseness. It allows me to create the most meaning out of the fewest words, in the least amount of time. 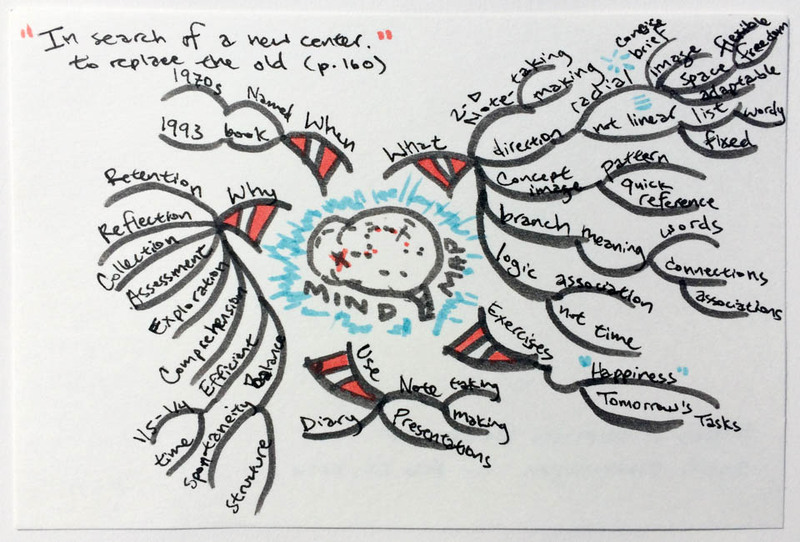 In this talk, I shared how I’ve used mind mapping in a variety of contexts, including conference sketchnotes, church sermons, and diary entries. Participants practiced by creating mind maps as a group and individually. Mind maps are useful to take notes during conferences, and by asking speakers to sign the pages afterward, it provides a good ice breaker for discussion. 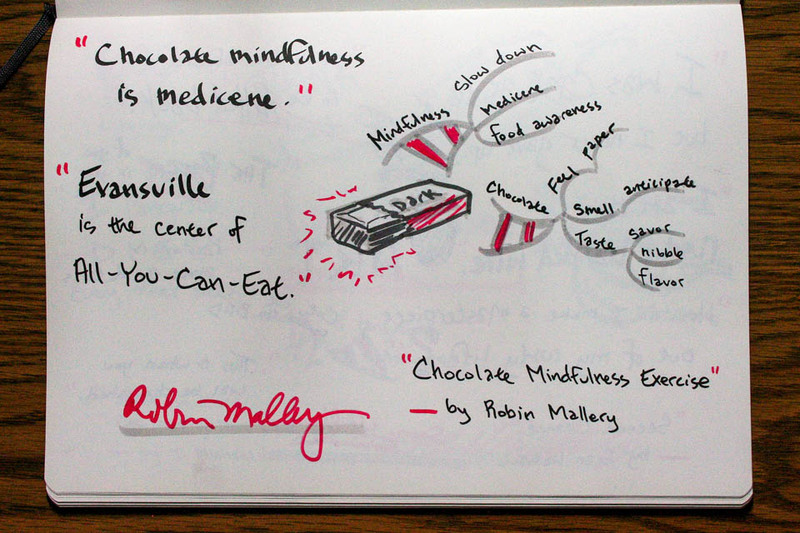 The Chocolate Mindfulness Exercise sketchnote was one of 13 sketchnotes created during TEDxEvansville 2015. 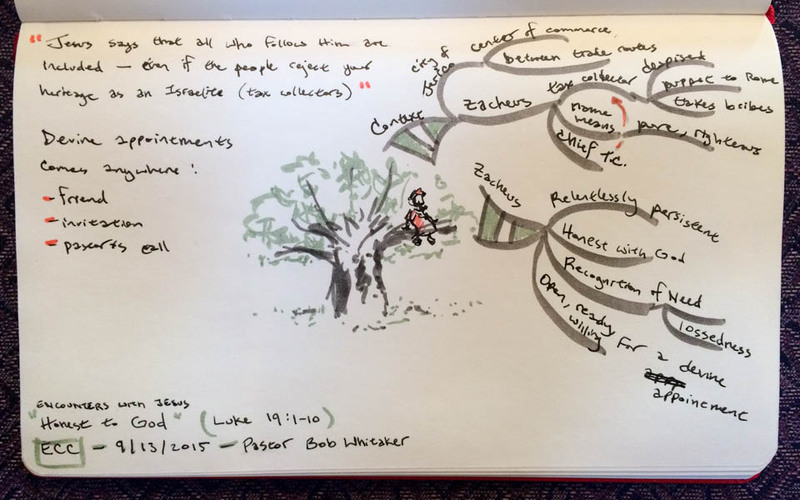 Church sermons, which normally follow a pattern of preaching about a central idea, pair well with mind map notes. Mind mapping can be used for diary entries. Branches grow from the hour locations around a 12-hour clock, with a full page spread representing one day. 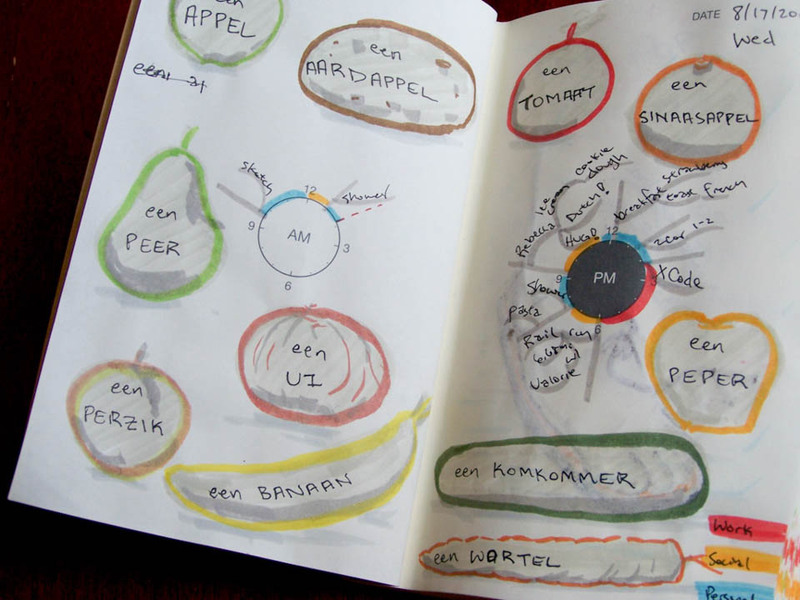 Sketches around the chrono-map help to evoke personal stories about that day. I elaborated on this diary technique in a talk titled Total Recall: An Experiment with Daily Sketch Diaries for Ignite Bloomington in 2011. 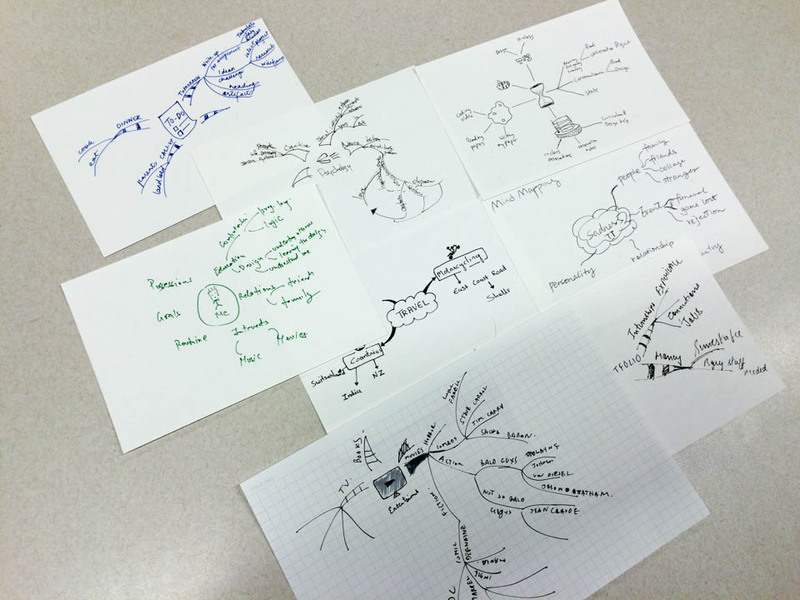 Mind mapping was initially demonstrated with a group exercise. Participants were asked about what came in mind concerning the central theme of Happiness, and the mind map was grown from those ideas. 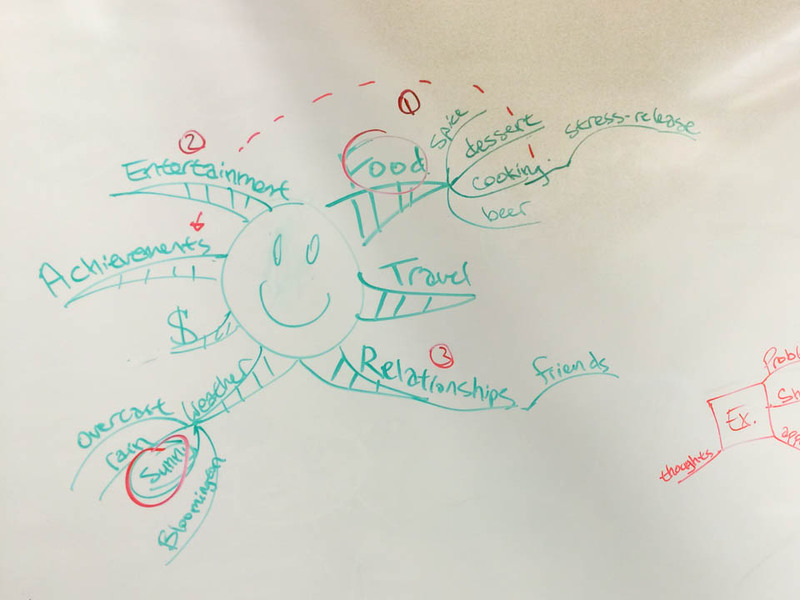 In four minutes, participants created mind maps concerning a variety of topics of their choosing, such as entertainment, travel, psychology, sadness, and tasks.